The past year has been full of activities and changes. Read about our programs and other activities in our annual newsletter. 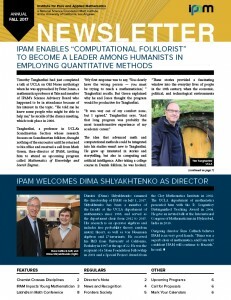 This year’s newsletter features Tim Tangherlini, an expert on Scandinavian folklore who has become a leader in bringing quantitative methods to the humanities, and Graeme Henkelman, a theoretical chemist and materials scientist who values the international collaborations he began at IPAM programs. Read also about IPAM’s new director, Dima Shlyakhtenko, two new Science Advisory Board members, the impact of IPAM on Virginie Ehrlacher, a new series of workshops on multiscale physics, and much more. Stop by IPAM to pick up a hard copy of the newsletter!